While most people only think of drawer slides in applications like filing cabinets and kitchens, there are actually hundreds of applications across many industries for high-quality drawer slides. Heavy-duty drawer slides, in particular, can be especially effective for people working in industrial, military, medical, service, and a variety of mobile applications. In many cases, a new drawer slide may allow people to get more work done in a safer environment than if traditional fixtures had been left in place. The modern production line and manufacturing floor is a complex and dynamic space, yet equipment needs to be highly reliable and efficient. Thinking of the people in manufacturing, OVIS carries a variety of off-the-shelf drawer slide solutions whose load ratings, duty cycle and quality makes them ideal for a variety of challenging applications on your factory floor. We offer products for everything from heavy-duty industrial situations, to compact and lightweight designs for more common uses around the parts department, shop or maintenance department the heavy-duty drawer slides, in particular, provide consistent performance in highly demanding environments. Today's modern factory is fast and demands precise drawer slides, the ones provided by OVIS feature smooth operation and a high level of lateral stability under heavy usage throughout their life. Many of our drawer slides incorporate a variety of other useful features like locking, overextension, soft close, and corrosion resistant materials that can make them unique for a variety of situations. Over the past 25+ years, OVIS has worked with thousands of customers looking for the ideal product that fits their situation. If you have a challenging project in mind give us a call today and can talk you through some useful solutions. A quality drawer slide can ensure that everyone working on the factory floor is safe and able to efficiently access the tools they need when they need them. OVIS offers heavy duty drawer slides with minimal chance of warping, meaning that even for drawers that will hold hundreds of pounds of equipment our drawer slides will continually stand up to the wear and tear of the average factory floor. 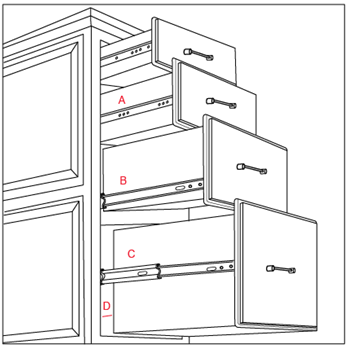 The full extension and overextension slides we offer allow your workers to have full access to all the content of a given drawer. We know that modern manufacturing demands a high degree of speed and accuracy in order to remain competitive. For this reason, full extension and overtravel drawer slides allow workers to quickly access the tools they need without little chance of error. Nothing cuts down on efficiency more than poorly organized drawers or a lack of visibility. For this reason, our heavy-duty full extension and overextension drawer slides may be an ideal solution to an inefficient shop space. Quality drawer slides can ensure unique presentation in even the most demanding retail environments. From the perspective of customers, displays that operate smoothly create a luxurious shopping experience. For staff, high-quality drawer slides make it easier to access products for restocking on the floor as well as in a variety of demanding situations such as in display windows. Our soft-close, heavy-duty, locking and full-extension drawer slide all offer features which can create a safe and efficient working environment for all of your employees. For highly demanding retail environments, such as jewelry and watch display, nothing can harm a sales situation more than a poorly functioning drawer slides, or awkwardly fishing under a display while speaking to a customer. Our drawer slides offer smooth operation and a variety of features, such as soft closing, which can maintain the environment of your store. The modern interiors that many industries now demand means that sleek and usable drawer slides integrated directly into your designs can be a factor differentiating you from the competition. Give us a call today and speak to one of our drawer slide experts. With over 25 years in the business, we can help you find the right product for even the most challenging installations. OVIS understands the stringent standards necessary in many mobile applications. The heavy-duty drawer slides we offer are especially useful in applications where you require access to sensitive and heavy applications in less than calm environments. While every project will be a little bit different, feel free to contact one of our representatives for advice on the ideal solution to your next project. Yachts: our line of Sugatsune drawer slides are also particularly effective in a variety of marine environments, where the salty weather would corrode many other products. Having access to the right equipment in the harshest of all work environments, out in the field, is especially important. When it comes to military or emergency service situations, you need to know that your drawer slides will work reliably and efficiently when it matters, keeping crews safe and granting you access to the products you need on command. The work conditions will always be a little different for each installation project but you can always give one of our drawer slide experts a call and we can help you find the ideal solution.